If you’re in search of martial arts for kids, our carefully designed children’s program develops self-discipline, self-confidence, respect and self-defense. We emphasize avoidance and resolution rather than confrontation and conflict. Fighting is desired only as the last resort. Positive reinforcement along with traditional martial arts training and discipline enhance the student’s Tae Kwon-Do experience. 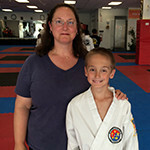 Unlike other schools, our students are not only required to master Tae Kwon-Do techniques but also maintain chores at home and meet their teacher’s expectations at school. As our program improves the students’ ability to focus, parents and teachers notice improved grades and concentration. Furthermore, Master Gorino checks with the students’ parents and teachers on a regular basis to monitor the students’ progress. All of these requirements must be met in order for students to advance to the next rank. This three-fold approach impresses upon the student that Tae Kwon-Do is not just kicking and punching but also includes being a good student, citizen, and son or daughter. 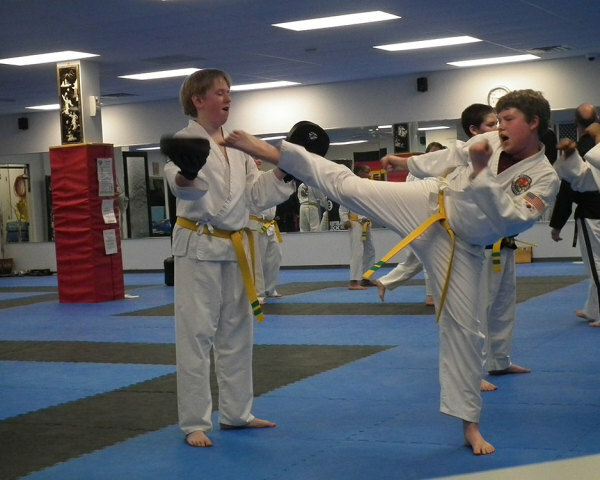 The development of self-confidence, self-discipline and self-respect gives the Tae Kwon-Do student the ability to say “NO” to negative peer pressure. My husband and I are so grateful to have found a program with an instructor who takes such care to support us in raising a dedicated, respectful, and honorable child. 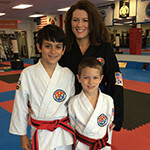 My son has been studying with Master Gorino for 3 1/2 years, and the change we have seen in him is amazing. He is physically stronger and more flexible. He has a confidence beyond his years. He has amazing mental stamina that others his age seem not to have. For example, he worked all day at school on his mandatory state aptitude tests, and then without complaint went to the dojang and spent 2 hours rigorously being tested for and subsequently passing his black belt test qualifier! My husband and I are so grateful to have found a program with an instructor who takes such care to support us in raising a dedicated, respectful, and honorable child.